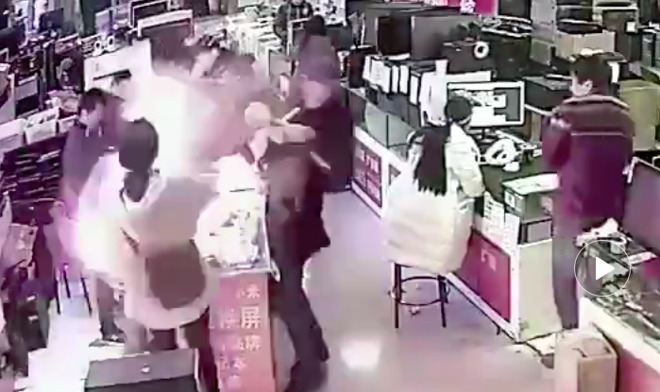 A man in an electronics store in China caused a replacement battery for his iPhone to explode by biting the component, according to a report, with footage from the incident quickly becoming a viral hit in the country within days of being uploaded to a video sharing service. The ten-second video shows the inside of the electronics store, with the unnamed man and his companion standing over a workbench and other customers and employees nearby. According to Taiwan News, the customer was in the store to acquire a replacement battery for an iPhone. The customer is seen bringing the component to his face for a closer look, before putting it in his mouth to bite down on it. Moments after he removes it from his mouth, the battery ruptures, causing a small explosion with a brief flash of light and some smoke, with the damaged hardware flung out of the customer's grip behind the counter. Despite the proximity to the man's face and other people, local reports note no-one was injured from the blast, though those in attendance were startled by the event. It is believed that the man decided to bite on the battery in an attempt to test its authenticity or durability, possibly following the same logic as people testing if an item is made from real gold. Chinese electronic stores are apparently known for their trade of fake goods, so the customer's need to check if the component is a genuine part is warranted, albeit not in this way. It is unknown if the incident is related to efforts by Apple to provide discounted iPhone battery exchanges, in the wake of the iPhone throttling revelation. Though Apple does operate the same discounted program in mainland China, it is unknown if the store in question is an Apple Authorized Service Partner or another third-party repair center, with the latter typically using components outside of the official supply chain. The unexpected incident has become a hit on social media in China in a short period of time. After taking place on January 19 and uploaded to video sharing site Miaopai.com on January 20, it has since been viewed over 4 million times. While comparisons could be made to the Samsung Note 7 battery fiasco, it is worth noting that this is a separate issue entirely. Samsung's manufacturing process for batteries introduced two different flaws that could cause overheating and rupturing, whereas this involves a battery not residing within an iPhone, and with a more direct method of causing a rupture.